In the closing days of World War II, with the German military collapsing on every front, U.S. forces reached the city of Leipzig. The 2nd Infantry, 69th Infantry and 9th Armored Divisions entered the city on April 18th and, after house-by-house combat, they secured it on April 19th. The next day, April 20th, war correspondents and photographers followed; one of the first was Margaret Bourke-White. At the Neues Rathhaus, the New City Hall, she found this scene. 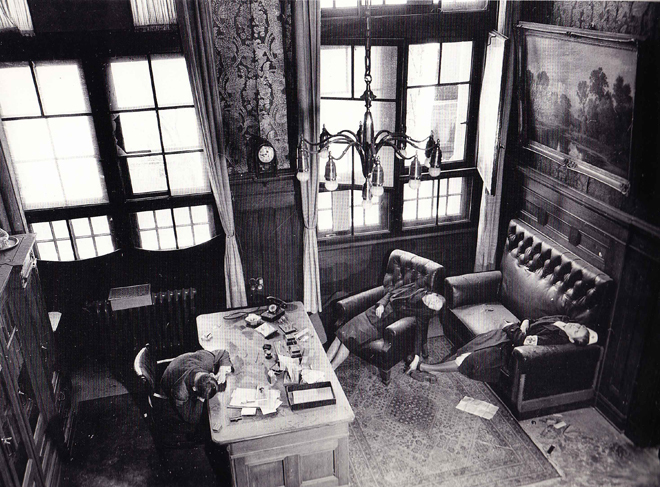 Two days before, with the sounds of the approaching armies coming through the broken windows, the Deputy Mayor, Ernst Kurt Lisso, with his Nazi party card on his desk at his elbow, had taken his own life with cyanide, as had his wife, Renate, and daughter, Regina, still wearing her German Red Cross armband. One account claimed that cyanide pills were distributed by the Hitler Youth during the last concert of the Berlin Philharmonic on April 12, 1945. During the Battle of Berlin, almost 4,000 Berliners killed themselves. And yet, there are still people in the world who think a war can turn out well. Photograph by Margaret Bourke-White from Bourke-White (1988), a catalog of a traveling exhibition of her work. haunting. What an incredibly perfect angle to photograph that scene from.